The Comac C919 is a narrow-body twinjet airliner developed by Chinese aerospace manufacturer Comac. The development programme was launched in 2008, production of the prototype began in December 2011, it rolled out on 2 November 2015 and the aircraft's maiden flight was on 5 May 2017. Its first commercial deliveries are expected in 2021 to China Eastern Airlines. The aircraft, primarily constructed with aluminium alloys, is to be powered by either CFM International LEAP or ACAE CJ-1000A turbofan engines, and be able to carry 156 to 168 passengers in a normal operating configuration up to 5,555 km (3000 nmi). It is intended to compete primarily with the Boeing 737 MAX and Airbus A320neo. As of 31 August 2018[update], Comac has 1008 commitments including 305 firm orders, mostly from Chinese leasing companies or airlines with the exception of GE. For the model number, the C stands for "COMAC" and "China"; 9 is a homophonic pun in Chinese with "forever"; while 19 refers to its capacity of 190 passengers. The C also has the implication that forms an "ABC" parallel situation with Airbus and Boeing. In Mandarin Chinese, 9 (Chinese: 九; pinyin: jiǔ) is a homophone of 久, meaning "forever" as a Chengyu in Chinese: 天长地久; pinyin: tiān cháng dì jiǔ. Model of the C919 from 2010. The 2008 program launch initially targeted a maiden flight in 2014. Comac applied for a type certificate for the aircraft from the Civil Aviation Authority of China on 28 October 2010. The company intends to manufacture up to 2,300 aircraft of that type. In June 2011, COMAC and Irish low-cost airline Ryanair signed an agreement to co-operate on the development of the C919 In 2012 Airbus' chief strategist Marwan Lahoud was assuming that the aircraft would offer competition to Airbus by 2020. On 24 November 2011, Comac announced the completion of the joint definition phase, marking the end of the preliminary design phase for the C919, with estimated completion of the detailed design phase in 2012. Production of the first C919 prototype began on 9 December 2011. The C919's aerodynamics were designed with the help of the Tianhe-2 supercomputer. The annual production was targeted at 150 planes by 2020. Canada's Bombardier Aerospace has been collaborating since March 2012 on supply chain services, electrical systems, human interface and cockpit; and on flight training, flight-test support, and sales and marketing, from June 2013. Its announced development budget is 58 billion yuan ($9.5 billion) but its actual cost is estimated at well over $20 billion. The flight testbed was expected to complete final assembly in 2014 and perform its first flight in 2015; however, delivery was delayed again until 2018 due to technical difficulties and supply issues. At the November 2014 Zhuhai Airshow, it was announced that the first flight would be delayed to 2017. On 2 November 2015, Comac rolled out its first C919 aircraft. In May 2018, a composite wing development since 2012 was revealed years after abandoning it for a metallic one, as static and damage tolerance tests were completed, verifying the structural design and strength before full-size composite wingbox tests. On 12 July, the static test aircraft simulated a 2.5g, 150% ultimate load, bending wings by nearly three metres for three seconds. High-speed taxi tests were completed in April 2017 and the first flight took place on 5 May 2017. At the time, Comac has a planned test programme of 4,200 flight hours and introduction to service in 2020. Slippage into 2021 was possible. The European Aviation Safety Agency is working to validate the Chinese type certificate. The 4,200h planned are higher than the 3,000h typically logged for the Airbus or Boeing narrowbodies, but lower than the 5,000h taken by the ARJ21. Comac powered on its second prototype on 28 July 2017, targeting to fly it within the year for engine, APU, fuel system and extreme weather tests. The first has not flown since the maiden flight but no major issues have surfaced while small improvements are being made. The flight-test plan and modules was going to be detailed and will use six aircraft. On September 28, it made its second flight at 10,000 ft (3,000 m), which lasted 2 hours 46 minutes, although it was supposed to last one more hour. While the second prototype is ground tested, this five-month interval is extraordinary: in 2013 the Airbus A350 flew again after five days and in 2015 the troubled Mitsubishi MRJ flew again after eight days. On November 3, it made its third flight in 3h 45min, reaching 3,000 m (9,800 ft). It was then transferred on 10 November from Shanghai to Xian to continue its flight test campaign, a 2h 24min, 1,300 km (700 nmi) flight reaching 7,800 m (25,600 ft) and Mach 0.74 (825 km/h; 445 kn). The second prototype made its first flight on 17 December 2017. The first three prototypes will test its performance and dynamic or power systems including the turbofans. The fourth prototype will test the mission systems, like the avionics, and the electrical system. The fifth and sixth prototypes test passengers service, including the cabin and information system. The delay between first and subsequent flights underline the program immaturity by maiden flight: flying early at low speed and altitude is possible but faster and higher is limited by aeroelastic flutter needing ground vibration testing and aircraft instrumentation which were not ready in May. Due to flight testing problems, the 2020 introduction previous schedule was delayed to 2021, for China Eastern Airlines. In February 2018, the first prototype was flying more than once a week. In June 2018, Aviation Week reported the flight-test aircraft grounding for modifications, extending the schedule by three months but maintaining a 2020 certification target. The two prototypes were having their flaps and tailplanes modified, due to delamination of the carbon-fiber reinforced plastic elevators. Flight tests should restart in July 2018, fuel tanks were also modified. The third test aircraft was also being modified and maximum-rate pressurization was tested. As three other planes will be available in 2019, Comac maintains first deliveries for 2021. Comac denied any grounding and highlighted that modifications are part of the flight test process, stating the two first aircraft were flying stability tests and checking systems. The first was calibrated and had its counterweight and trailing cone systems modified while the second had its functions and systems checked and will be transferred to the Dongying test base. The third was in final assembly with its wing and fuselage joined, cables and systems were being installed for a first flight target by the end of the year. On 12 July, the second prototype flew from Shanghai-Pudong to Dongying Airport in 1h 46min to allow for various meteorological conditions testing. In September, Comac expected to conduct 1,500 test flights for over 2,000 hours before the first delivery and planned to fly the third prototype before the end of 2018. 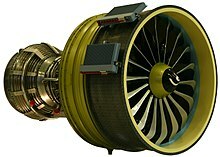 In October 2018, the flight-deck design is re-evaluated to comply with US FAR Part 25.1302, not necessary for CAAC but for FAA certification to sell it outside of China, as COMAC go through the learning curve of the aircraft design process, and developing indigenous competitors for the CFM Leap-1C would take at least another 15 years. By then, the two prototypes had flown less than 150 h, averaging less than 5 h per month each. To achieve certification in December 2020 and first delivery in 2021, the planned 4,200 h of flight tests would need 33 h a month each if the last four prototypes are evenly spaced before year-end-2019. Newest airliner designs like the Airbus A350 needed a 2,600 h campaign, and the Mitsubishi MRJ is expected to need 3,000 h. By 2018 end, the first prototype was to enter flutter flight tests after having completed ground tests. The third prototype made its maiden flight by 28 December over 1h 38 min. The dimensions of the C919 are quite similar to those of the Airbus A320; its fuselage is 3.96 metres (13.0 ft) wide and 4.166 metres (13.67 ft) high with a 12.915 square metres (139.02 sq ft) cross-section. This may allow for a common unit load device to be used for both aircraft. It has a 33.6 metres (110 ft) wingspan (35.4 metres (116 ft) with winglets). The aircraft's intended payload capacity will be 20.4 tonnes. The design calls for cruise at Mach 0.785 (450 kn; 834 km/h) with an operating ceiling of 12,200 metres (39,800 feet). There will be two variants: the standard version with a 4,075 km (2,200 nmi) range, and a 5,555 km (2,999 nmi) extended-range version. The C919 is a cautious design, similar to the 30 years older A320. The center wing box, outer wing box, wing panels, flaps, and ailerons are planned to be built in Xi'an, China; the center fuselage sections are planned to be built in Hongdu, China. Aluminium-lithium alloys account for 8.8% of the structure and composite materials for 12%. The air frame will be made largely of aluminum alloy. Aircraft design and assembly is performed in Shanghai. The wing is supercritical, increasing aerodynamic efficiency by 20% and reducing drag by 8% compared to a non-supercritical one. The center wing box was originally intended to use carbon fibre composites. It was changed later to an aluminum design to reduce design complications. The engine's nacelle, thrust reverser and exhaust system will be provided by Nexcelle, with such features as an advanced inlet configuration, the extensive use of composites and acoustic treatment and an electrically operated thrust reverser. Michelin will supply Air X radial tyres. Its integrated modular avionics architecture is based on Ethernet. The landing gear is made in China by a joint venture of Germany's Liebherr and Avic’s Landing Gear Advanced Manufacturing Corp: Liebherr LAMC Aviation. While the airframe is entirely made by Chinese Avic, most systems are made by Western-Chinese joint-ventures: with UTAS for the electric power, fire protection and lighting; with Rockwell Collins for the cabin systems and avionics, with Thales for the IFE, with Honeywell for the flight controls, APU, wheels and brakes; with Moog for the high lift system; with Parker for the hydraulics, actuators and fuel systems, with Liebherr for the landing gear and air management; and the CFM engine and Nexcelle nacelle are entirely foreign. Both Pratt & Whitney and CFM International offered to provide the engines for the aircraft, the former offering the PW1000G and the latter the LEAP-1C; the latter was ultimately selected. AVIC Commercial Aircraft Engine Co was also tasked with developing an indigenous engine to be used with the aircraft. The ACAE CJ-1000A was unveiled at the 2012 Zhuhai Airshow. The first CJ-1000AX demonstrator assembly was completed in December 2017 after an 18-month process, for an after 2021 planned service entry. Debugging was completed by March 30, 2018, culminating in May 2018 with its first power-on in a test cell in Shanghai, reaching a core speed of 6,600 rpm. In 2012 the C919 order book stood at 380 units worth US$26 billion, and averaging $68.4 million. FlightGlobal's Ascend market values in 2013 were $49.2 million for the Airbus A320neo, 51% less than its $100.2 million list price and $51.4 million for the Boeing 737 MAX-8, 49% less than its $100.5 million list price. In June 2015, the China National Radio predicted a $50 million price, cheaper than the B737 or A320 list prices. The Chinese airlines that have placed orders for the C919 already have either the Boeing 737 or Airbus A320 in their fleets. In 2013, Chinese state-owned newspaper Global Times complained that an Aviation Week editorial about the bleak prospects for the aircraft "maliciously disparaged the future outlook for the C919". COMAC aims to take a fifth of the global narrowbody market and a third of the Chinese market by 2035. It expects 2,000 sales in the next 20 years. China considers it as a source of national pride. The Financial Times states the C919 is outdated by 10–15 years compared to the latest versions of the A320 and Boeing 737, and will probably cost more to operate. Its range of 2,200–3,000 nmi (4,100–5,600 km) falls short of the 3,400 and 3,550 nmi (6,300 and 6,570 km) of the A320neo and 737 Max 8, the C919 payload-range and economic are similar to the current single-aisles, but it will compete with the Neo and Max. FlightGlobal forecasts 1,209 deliveries: 687 standard and 522 stretched variants, for 85% in China. At the November 2010 Zhuhai Airshow, Comac announced orders for 55 C919 aircraft from six airlines, with an additional 45 options. The purchasing airlines or lessors included China Eastern Airlines, Air China, Hainan Airlines, China Southern Airlines, CDB Leasing Company, and GE Capital Aviation Services. On 19 October 2011, Chinese ICBC Leasing ordered 45 C919s and agreed to be the launch customer. On 11 November 2014, Comac announced at the 2014 Zhuhai Airshow that China Merchants Bank's aircraft leasing division made a firm commitment for 30 C919s, and that total orders were now up to 450 aircraft. At the June 2015 Paris Air Show, Ping An Leasing signed a letter of intent for 50 C919s, becoming one of Comac's largest customers, and Puren Group signed a letter of intent for seven C919s and seven ARJ21s, intended for the start-up Puren Airlines. In November 2016 COMAC has received an order for 20 C919s including 5 firm from Shanghai Pudong Development Bank Financial Leasing and for 36 C919s from CITIC Group Financial Leasing including 18 firm. While no down payments were needed before its maiden flight, 500,000 yuan ($76,000) were deposited subsequently for each firm order. The last ICBC Leasing order for 55 on 5 December 2017 brought the order book to 785. In February 2018, its total order book was for 815, before the order for 200 from HNA Group in June 2018, along 100 ARJ-21s. As of 31 August 2018, FlightGlobal recenses 305 orders plus 45 options and 658 letters of intent: 1008 commitments. ^ a b Greg Waldron (5 May 2017). "Comac C919 lands after uneventful maiden sortie". Flight Global. ^ a b Brenda Goh (5 February 2018). "China's COMAC says first delivery of C919 jet planned for 2021". Reuters. ^ a b Greg Waldron (28 Dec 2018). "Third C919 prototype operates first flight". Flightglobal. ^ a b Perrett, Bradley (16 December 2013). "C919 May Be Largely Limited To Chinese Market". Aviation Week & Space Technology. ^ "China Focus: China's homegrown jumbo passenger jet takes to the sky". Xinhua. May 5, 2017. ^ "China-made C919 to compete with Airbus, Boeing". Shanghai Daily. Retrieved 2017-06-10. ^ a b Katie Cantle (5 May 2017). "COMAC launches C919 inaugural flight". Air Transport World. Aviation Week. ^ "Zhuhai10: COMAC releases C919 specifications". Flight Global. 16 November 2010. ^ a b Richard Aboulafia (2010). Comac C919 Program Briefing (PDF). World Military & Civil Aircraft Briefing (Report). pp. 78–81. Archived from the original on June 2011. ^ "Ryanair and COMAC Sign C919 MOU in Paris" (Press release). Ryanair. 12 December 2013. ^ "Airbus to Seek Alliances as Rivals Try to Sell Big Planes". Bloomberg. 14 February 2012. ^ "C919 project at "crucial point" in detailed design". Flight Global. 25 November 2011. ^ "COMAC begins pilot production of C919 jet". People's Daily Online. 16 December 2011. ^ "China's Tianhe-2 retains supercomputer crown". Xinhua. 23 June 2014. Archived from the original on 29 June 2014. ^ Agence France-Presse (19 November 2012). "China's COMAC Collects 50 More Orders for Home-grown C919 Airplane". Industry Week. ^ Mavis Toh (4 Dec 2013). "Comac and Bombardier discuss next phase of collaboration". Flight Global. ^ "China's C919 large airplane schedule to take first flight in 2015". People's Daily Online. 18 February 2014. ^ Ren, Daniel (22 May 2014). "China's first large airliner delayed by technology problems". South China Morning Post. ^ "China Planemaker Gets New Orders in Fight With Airbus, Boeing". Bloomberg. 11 November 2014. ^ "China's Comac rolls out C919 jet, ground tests to start soon". Reuters. 1 November 2015. Retrieved 2 November 2015. ^ "China's Airbus: Country to roll out first indigenous passenger jet in Shanghai after 7-year wait". South China Morning Post. 2 November 2015. Retrieved 2 November 2015. ^ Jiang, Steven (2 November 2015). "China takes on Boeing, Airbus with homegrown passenger jet". CNN. ^ Mavis Toh (25 June 2018). "Comac completes static tests for composite wing project". Flightglobal. ^ a b Greg Waldron (13 July 2018). "PICTURES: C919 undergoes ultimate wing load test". Flightglobal. ^ Katie Cantle (25 April 2017). "COMAC C919 completes high-speed taxi tests; cleared for first flight". Air Transport World. Aviation Week. ^ "China's first big passenger plane takes off for maiden flight". BBC News Online. Retrieved 5 May 2017. ^ Bradley Perrett (May 18, 2017). "Source: COMAC C919 targets first delivery for 2020". Air Transport World. Aviation Week Network. ^ "Civil Aviation Programs To Watch". Aviation Week & Space Technology. Jun 9, 2017. ^ a b c d Firdaus Hashim (26 Oct 2018). "Comac marches forward with ARJ21 and C919". Flightglobal. ^ Mavis Toh (31 July 2017). "Comac achieves power-on for second C919 prototype". Flightglobal. ^ Greg Waldron (28 Sep 2017). "Comac C919 completes two hour second flight". Flightglobal. ^ Bradley Perrett (Sep 19, 2017). "Second Comac C919 Flight Imminent, Five Months After First Flight". Aviation Week. ^ Mavis Toh (3 Nov 2017). "C919 takes third flight; engines start up on FTA 2". Flightglobal. ^ Mavis Toh (10 Nov 2017). "Comac transfers C919 to Xian for flight tests". Flightglobal. ^ "Second China-made large passenger jet completes first trial flight". CGTN. 17 Dec 2017. ^ a b c Bjorn Fehrm (January 3, 2018). "United Aircraft's and COMAC's eventful year". Leeham. ^ Bradley Perrett (Feb 6, 2018). "Comac Aiming At 2021 For C919 First Delivery". Aviation Week Network. ^ Bradley Perrett (Jun 15, 2018). "Comac Suspends C919 Flight Testing For Modifications". Aviation Week Network. ^ "COMAC suspends the flight tests for C919". AirlinerWatch. Jun 18, 2018. ^ Mavis Toh (22 June 2018). "Comac stresses progress as C919 prototypes fly". Flightglobal. ^ a b Bradley Perrett (Sep 26, 2018). "Third Comac C919 Flight Test Aircraft To Fly This Year". Aviation Week Network. ^ Jennifer Meszaros (October 17, 2018). "Comac C919 Stumbles on FAA Flight Deck Standards". AIN online. ^ Bradley Perrett (Nov 20, 2018). "Comac C919 Testing Needs To Accelerate". Aviation Week & Space Technology. ^ Greg Waldron (18 Dec 2018). "Comac gears up for C919 flutter tests". Flightglobal. ^ a b Bradley Perrett (8 September 2009). "Comac Begins Building C919 Structure". Aviation Week. ^ "COMAC C919 – program supplier guide". Airframer Limited. Stansted News. 24 March 2017. ^ "COMAC Rolls Out First C919 in Shanghai" (Press release). Comac. 2 November 2015. ^ An Xinzhu (6 April 2017). "Jumbo Jet Collaborative Innovation". China Today. ^ Mavis Toh (4 July 2014). "Xian Aircraft rolls out first C919 center wing box". Flight Global. ^ "High Tech Nacelle for C919 Said To Be World First". Aviation Daily. Aviation Week. 5 February 2010. ^ "Michelin to supply tyres for China's first commercial airliner" (Press release). Michelin. 12 April 2011. Archived from the original on 21 April 2017. ^ "Pratt offers geared turbofan for China's C919 airliner". Flight Global. 5 October 2009. ^ David Kaminski-Morrow (21 December 2009). "CFM to build LEAP-X engine in China after C919 deal". Flight Global. ^ "C919 set to fly with imported engines initially". Shanghai Daily. 4 November 2011. ^ Stephen Trimble (29 Dec 2017). "China completes assembly of first high-bypass turbofan engine". Flightglobal. ^ Mavis Toh (18 May 2018). "C919's local engine alternative powered up". Flight Global. ^ Yu Dawei and Liang Dongmei (18 December 2012). "Comac C919 Airliner Project Flying in the Dark". Caixin Online. China Aviation Daily. ^ Vincent Lamigeon (13 June 2013). "Le vrai prix des avions d'Airbus et de Boeing" (in French). Challenges.fr. Archived from the original on 9 April 2015. ^ Chloe Lyme (2 November 2015). "Superjet made-in-China: First look inside the C919 passenger plane as the country's home-made airliner makes its worldwide debut". Mail Online. ^ "COMAC C919, against Airbus and Boeing duopoly". Airlineberg. 19 May 2012. Archived from the original on 12 November 2012. ^ Joe Anselmo (18 July 2013). "China Newspaper Slams Aviation Week For 'Oppressive Scheme". Aviation Week. ^ "What C919 means to China jet industry and domestic airlines". EJ Insight. May 5, 2017. ^ "China's challenger to Airbus and Boeing set for skies at last". Financial Times. April 29, 2017. .
^ Ben Bland (17 May 2017). "Chinese aviation finally takes off with help from the west". Financial Times. ^ a b c d e f Bradley Perret (16 November 2010). "Hainan, Gecas To Be Among First Customers For C919". Aviation Week. Archived from the original on 16 November 2010. ^ a b "ICBC Financial Leasing Co., Ltd. signs the agreement of 45 C919 orders with COMAC" (Press release). 19 October 2011. ^ a b Katie Cantle (12 November 2014). "COMAC wins more orders for C919, ARJ21". Air Transport World. Aviation Week. ^ a b c "Comac wins commitments for 64 jets". Flight Global. 15 June 2015. ^ a b c Toh, Mavis (1 November 2016). "Comac wins lessors' orders for 23 C919s". Flight Global. ^ a b c d e Brenda Goh (Sep 19, 2017). "China's COMAC says signs 130 orders for C919 passenger jet". reuters. ^ a b "China's ICBC Financial Leasing orders 55 C919 planes". Reuters. 5 Dec 2017. ^ a b "China's HNA, COMAC sign deal for 200 C919, 100 ARJ21 jets Reuters". Reuters. June 2, 2018. ^ a b c "COMAC signs C919 Aircraft Purchase Agreement and MOU with domestic and foreign customers, making total C919 orders hit 380" (Press release). Comac. 13 November 2012. ^ Cantle, Katie (21 October 2011). "Sichuan Airlines inks firm order for 20 C919s". Air Transport World. Aviation Week. ^ Toh, Mavis (23 November 2011). "Bank of Communications' leasing arm orders 30 C919s". Air Transport Intelligence. Flight Global. ^ Katie Cantle (9 December 2011). "China Aircraft Leasing orders 20 COMAC C919s". Air Transport World. Aviation Week. ^ "BOC Aviation Signs Launch Customer Agreement with Commercial Aircraft Corporation of China for 20 C919 Aircraft" (Press release). BOC Aviation. 14 February 2012. ^ Katie Cantle (29 June 2012). "China's ABC bank orders 45 C919s". Air Transport World. Aviation Week. ^ Hashim, Firdaus (2 July 2012). "China's ABC Leasing orders 45 C919s". Flight Global. ^ "CCB Financial Leasing orders 50 C919 passenger aircraft". 19 September 2012. ^ "400 orders for C919 show sky-high confidence". chinadaily.com.cn. 29 October 2013. ^ Toh, Mavis (30 January 2015). "Huaxia Financial Leasing signs LOI for 20 C919s". Flight Global. ^ "Lübeck, Germany files for insolvency – again". ch-aviation. 6 October 2015. ^ Mavis Toh (12 June 2017). "Long march ahead for China airliner exports". Flight Global. ^ Toh, Mavis (16 September 2015). "Thailand's City Airways signs for 10 C919s, 10 ARJ21s". Flight Global. ^ Mavis Toh (13 June 2017). "Everbright Financial Leasing signs for 30 C919s". Flightglobal. ^ Daniel Tsang (19 April 2011). "COMAC C919 threat overblown". Aspire Aviation. ^ "Single-aisle commercial jets engines : LEAP-1C". Safran. 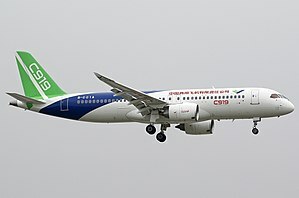 Wikimedia Commons has media related to Comac C919. Jose Fuentes (June 2011). "Commercial Aircraft Corporation of China (Comac) Attempts to Break the Airbus-Boeing Duopoly, Will It. Succeed? an industry analysis framework applied" (PDF). master of science in engineering and management thesis. MIT.